Happy Bloggers Challenge Friday! Thanks for stopping by today, I hope you've been having a great week. We've had quite a bit of rain this week, but I was happy to see my Rhododendron start to bloom. I used the flowers color as my color inspiration for this weeks Bloggers Challenge. This weeks theme is to Alter It. I've had these frames in my alterable stash for quite some time, every now and again you can find them in the $2.50 spot at Target. All stamps are from Our Daily Bread Designs. I stamped the sentiment first using a SAMJ, then stamped the floral image and colored using the Marker Watercoloring Technique. I added a few Pixie Pink Butterflies and Basic Grey Half Pearls for embellishments. Looking for more alterable inspiration, be sure to click on the Bloggers Challenge Logo on my sidebar to see what the other players created this week. This is beautiful, Lisa! So cheery! This is gorgeous Lisa - and I love the pop of color! Your Mom will love it! Very pretty, have a place for it! I love those frames as well. You mom is going to ADORE this!!! Your coloring is beautiful and love your choice of colors! I love these frames and can never find them anymore...if you see some let me know, I may have you pick me up some as they are the perfect size for gifts. Love this frame, it's gorgeous, the flower colors are perfect!!! So beautiful. Love the color combination. This would be a perfect and heartfelt gift for my mom. I love the idea and wouldn't change a thing about yours -- it's drop dead gorgeous! 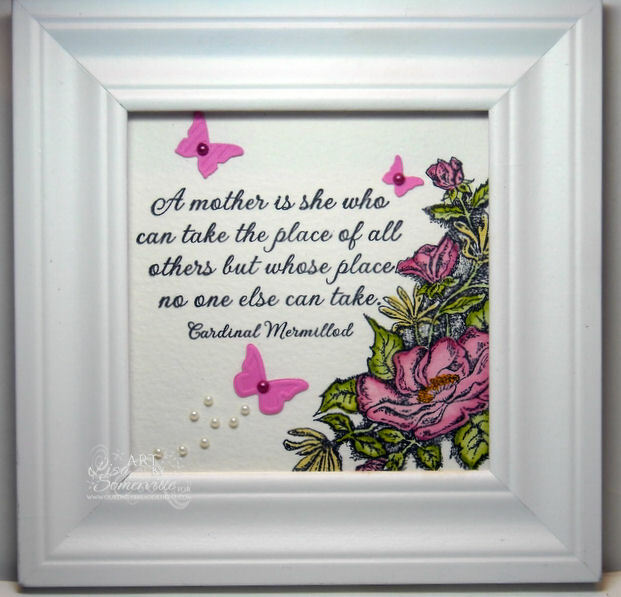 Beautiful sentiment and love the frame! Your mom will have a wonderful gift! This is beautiful Lisa, and it gives me an idea to make something for my own mom! So pretty!! I think I need to find me some of those frames!! Who needs surprises when the gift is this AWESOME!!! This is absolutely lovely! I love how you used the butterflies to accent those gorgeous flowers! Awesome!! You are the queen of the altered frame!! Wow! This is so pretty I love the colors. Oh what a beautiful framed picture. So pretty! Beautiful! I love the sentiment and the image! Lisa-It's now Thursday and I'm finally viewing these! Your frame is lovely--how precious!